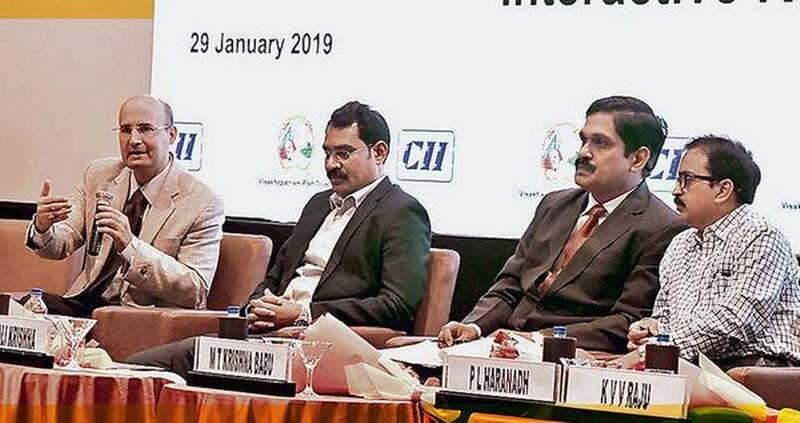 The Confederation of Indian Industry in association with the Visakhapatnam Port Trust on Tuesday showcased the investment potential along the 7,500-km long coastline in the country and listed the initiatives taken up under the Sagarmala Project to improve connectivity and give a push to port-led development. Several speakers including Sagarmala Project Director D.K. Rai, CII Director-Energy & Infrastructure Saikat Roy Chowdhury, Visakhapatnam zone chairman G. Murali Krishna, vice-chairman K.V.V. Raju, VPT Chairman M.T. Krishna Babu and Deputy Chairman P.L. Haranadh spoke about the importance of the Maritime Conclave-2019 which will be held in Bhubaneswar on February 14 and 15. Mr. Rai said exporters and importers, as well as those involved in various sectors linked to the marine industry, should attend the conclave to know about the opportunities in the sector. Online registrations are allowed on www.maritime invest.in/delegates- registration. A website opened for the conclave www.maritimeinvest.in may also be visited for more updates. Mr. Rai said stakeholders would get an opportunity to network with policy-makers, senior officials, business leaders and market experts to forge new partnerships and gain a competitive advantage.